Join Us for a Celebration of Easter! Our most inspiring services of the year! This year we have two identical celebrations in our beautiful sanctuary in front of our majestic waterfall. There will be a beautiful dramatic re-enactment and telling of the Easter Story by Pastor Tim White as well as amazing music featuring the choir and worship band with special guests. A delicious Easter Breakfast will be served Easter morning from 8:00-9:30 and 10:30-11:00. *All services and the breakfast will take place in the lower building. Kids will enjoy hunting for floating Easter Eggs in this indoor warm-water pool that is 4ft deep, max. Pool is located at the Northeast corner of upper building. Bring swimsuits and towels and enjoy a great family time. Everyone will enjoy the view from the hill above the church building that overlooks Sammamish Valley. 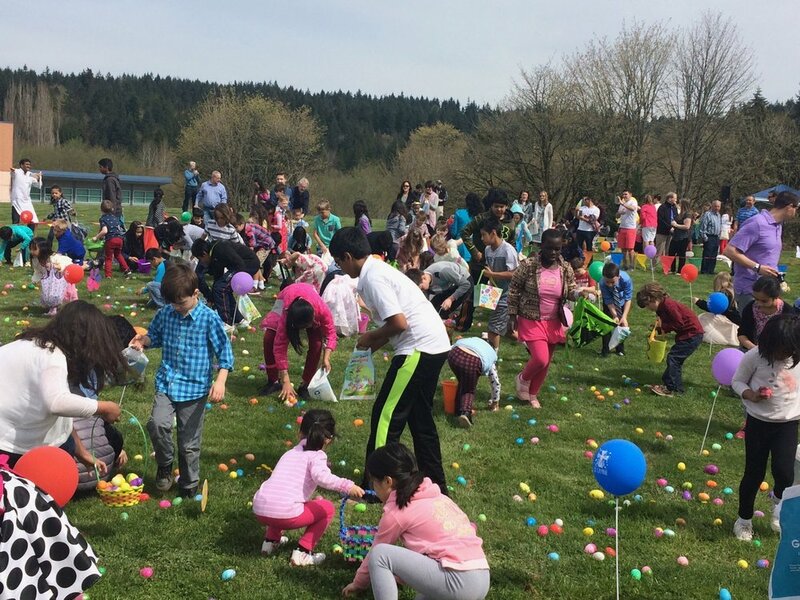 Kids will enjoy age specific egg hunt areas and bounce houses! 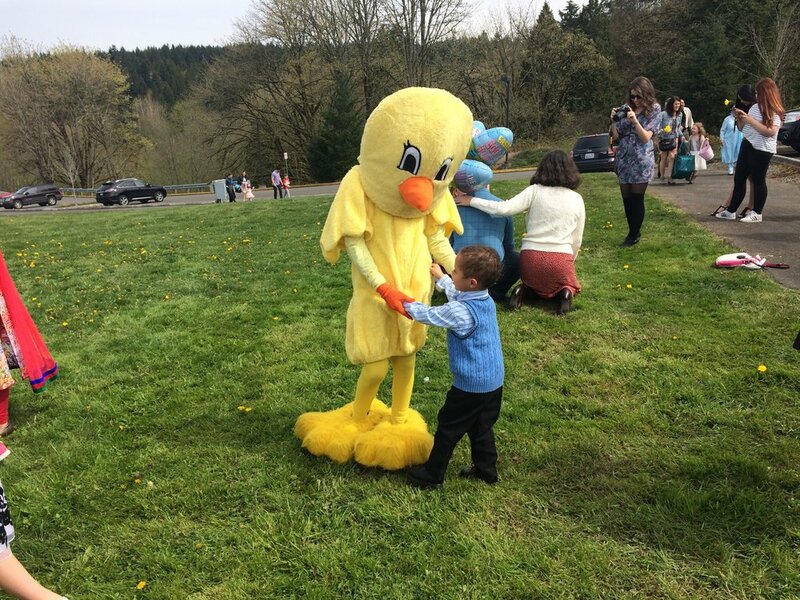 Little ones will love meeting and taking pictures with Charity Chicken. If it is raining or the field is too muddy the egg hunt will be held in the lower building. For Christians, Good Friday is a crucial day of the year because it celebrates what we believe to be the most momentous weekend in the history of the world. Ever since Jesus died and was raised, Christians have proclaimed the cross and resurrection of Jesus to be the decisive turning point for all creation. Join us as Pastor Linda leads in a time of worship. On this special day between the death and the resurrection of Jesus we will have a special service led by Dr. Marty followed by a meal and time of fellowship as we anticipate the coming glory of Easter. Greet Easter morning in our beautiful Spirit Falls Sanctuary. Worship at the foot of our spectacular mountain waterfall decorated with the rugged crosses of Easter. The music will be inspiring, and Pastor Josh will share a short encouraging message. Communion will be served at this service for those who want to celebrate the Lord’s Supper on Easter. Easter Breakfast Served right after this service until our first, main Easter Celebration Service begins at 9:30.